Just wanted to let you know about a cool thing going on at The Shops at North Bridge in Chicago this holiday season. Windows is offering free holiday photos for families, friends and even pets (on certain days). 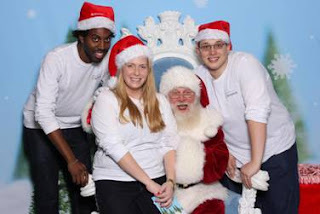 Guests can take a picture with Santa (or a winter back-drop), edit, and print their photo all for free. The set up is located in the guest lounge by Nordstrom and will be up and running through December 24. It’s a fun (and free) way to kick off the holidays with the kids. Plus for families traveling during the holidays, free holiday photos will also be available in 21 airports nationwide including Chicago Midway. Be sure to check out www.freeholidayphotos.com for all the details.